Mrs. Frances Katherine Anderson, age 105, passed away Thursday, April 11, 2019. She was born in Grand Rapids, MI on Thanksgiving Day, November 27, 1913 to Frank & Carrie (Strang) Swem. She and her sister Louise both graduated with honors from Muskegon High School in 1930. 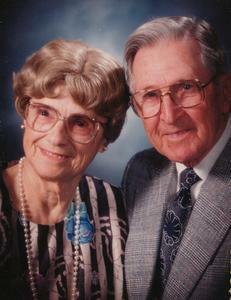 Frances married Clarence Anderson on April 9, 1934. Mrs. Anderson had been employed as a Registered Nuclear Medicine Technologist (RNMT) for Hackley, Butler & Mercy Hospitals until retiring in 1979. She was registered in 1963 with the very first registry ever offered in RNMT. At that time Frances was the only RNMT in Muskegon and northward in Michigan. That fact put her in Many "who's Who" publications. Until her stroke in 2002 Frances was a member of Forest Park Covenant Church where she was active in the Sunday School, the Choir and also worked as the Church Executive Board Secretary. In her early years she also was involved in the PTA and local theater and loved traveling. Frances always kept herself mentally and physically fit. She was a long time member of Omni Fitness Center and worked out well into her late 80's. She was an avid reader and loved doing crossword puzzles. Frances will be greatly missed. Sons, Robert (Sally) Anderson of Muskegon, Stanley (Shirley) Anderson of Muskegon; daughter, Clarelyn (Roger) Schmelling of Auburn Hills; 5 grandchildren; several great grandchildren. She was preceded in death by her husband, Clarence in 2005 and sister, Louise Lillie. Thursday, April 18, 2019, 11:00 AM at Forest Park Covenant Church with Pastor Larry Bush officiating. Internment in Oakwood Cemetery. Wednesday from 6:00 PM to 8:00 PM at Clock Funeral Home – Muskegon and Thursday, one hour prior to the service at the church. MEMORIAL: In lieu of flowers, please consider giving to Forest Park Covenant Church.